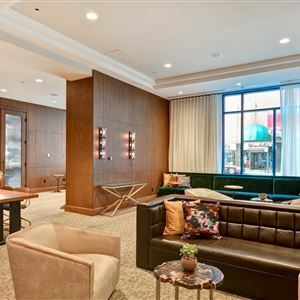 Property Location With a stay at Cincinnatian Hotel, you'll be centrally located in Cincinnati, steps from Contemporary Arts Center and Fountain Square. 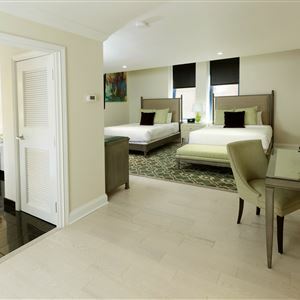 This 4-star hotel is close to Newport Aquarium and University of Cincinnati. Rooms Make yourself at home in one of the 146 air-conditioned guestrooms. Complimentary wireless Internet access keeps you connected, and satellite programming is available for your entertainment. Private bathrooms with bathtubs or showers feature designer toiletries and hair dryers. Conveniences include phones, as well as safes and desks. Amenities Take advantage of recreation opportunities such as a 24-hour fitness center, or other amenities including complimentary wireless Internet access and wedding services. Getting to nearby attractions is a breeze with the complimentary area shuttle that operates within 3. 0 mi. Dining Enjoy a satisfying meal at a restaurant serving guests of Cincinnatian Hotel. Business, Other Amenities Featured amenities include complimentary wired Internet access, a business center, and express check-out. With a stay at Cincinnatian Hotel, you'll be centrally located in Cincinnati, steps from Contemporary Arts Center and Fountain Square. This 4-star hotel is close to Newport Aquarium and University of Cincinnati. Make yourself at home in one of the 146 air-conditioned guestrooms. Complimentary wireless Internet access keeps you connected, and satellite programming is available for your entertainment. Private bathrooms with bathtubs or showers feature designer toiletries and hair dryers. Conveniences include phones, as well as safes and desks. Take advantage of recreation opportunities such as a 24-hour fitness center, or other amenities including complimentary wireless Internet access and wedding services. Getting to nearby attractions is a breeze with the complimentary area shuttle that operates within 3. 0 mi. Enjoy a satisfying meal at a restaurant serving guests of Cincinnatian Hotel.